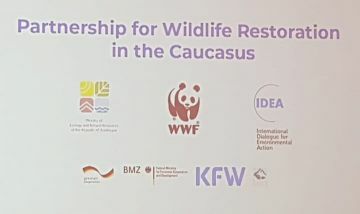 International scientific conference called “Partnership for Wildlife Restoration in the Caucasus” has started within Caspian Ecology 9th Azerbaijan International Environmental Exhibition. The aim of the conference is the conservation of biological diversity, identification of priorities for the development of the region's potential for natural rehabilitation, studying the experience of similar projects in the region, sharing information, and expanding regional cooperation. Minister of Ecology and Natural Resources Mukhtar Babayev, Minister of Environment Protection and Agriculture of Georgia, Levan Davitashvili, founder and head of IDEA Public Union Leyla Aliyeva, World Wildlife Fund (WWF), as well as officials and international experts from Azerbaijan, Russia, Turkey, Germany, Netherlands, Belarus, Iran are attending the event.